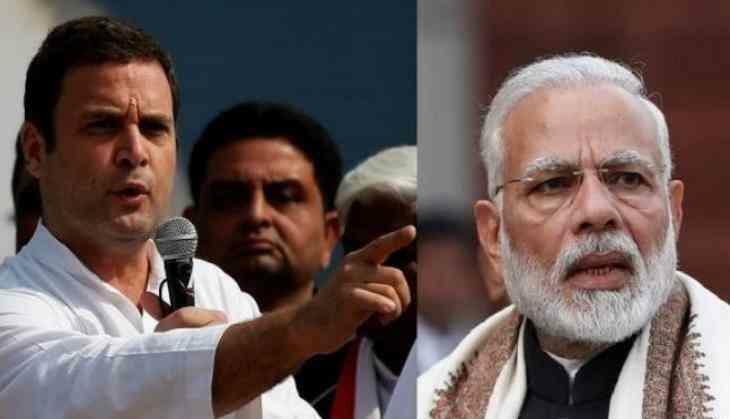 NEW DELHI: Congress president Rahul Gandhi stepped up his attack on Prime Minister Narendra Modi today and dared him for a five-minute debate with him on national security and the Rafale fighter jet deal. "Modi ji, you said you have a 56-inch chest. I challenge you to come a have a face to face debate with me. I challenge you," Mr Gandhi said. "I challenge the BJP, let Narendra Modi ji debate with me on stage. He is scared. He is a darpok (coward) person. I have recognised him," Mr Gandhi said. His debate challenge was followed by a roaring applause from the crowd and a standing ovation from the leaders seated on the dais. He was addressing the representatives of the party's minority cells from across the country. The Congress chief has challenged PM Modi to participate in a debate with him in the past too. In November last year, Mr Gandhi had challenged PM Modi to debate with him over the details of the Rafale deal. The Congress president has been scathing in his attacks against PM Modi on the Rafale fighter jet deal. He has coined the phrase "The watchman is a thief" - the watchman being a reference to the Prime Minister - and accused the ruling BJP of changing the UPA-era deal to benefit industrialist Anil Ambani. Yesterday, Mr Gandhi said the Congress should be able to defeat the BJP in the Lok Sabha elections without giving in to hatred and asked party workers to never use the word murdabad in connection with political adversaries. "We have promised a minimum income guarantee. It means that every poor person, in any corner of India, will get direct benefit transfer from the Congress," he said today.